Each spring the Kentucky Arts Council hosts the state-wide Poetry Out Loud competition for high school students. 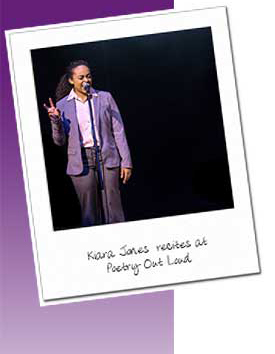 Poetry Out Loud is a national poetry recitation competition funded by the National Endowment for the Arts, The Poetry Foundation and state arts agencies like the Kentucky Arts Council. Its purpose is to promote the art of poetry in both the classroom and the community and to encourage students to learn poetry through memorization and performance. Students who participate master public-speaking skills, build self-confidence and learn about our nation’s literary heritage. In Kentucky, every participating classroom receives funding for a hands-on workshop with an arts council teaching artist. The artist works with the students on their public presentation, memorization and interpretation of their chosen poems. Participating schools receive free curriculum materials, including a teacher’s guide, poetry anthologies, audio guides and posters. Poetry Out Loud uses a pyramid structure that begins at the classroom level. Winners advance to the school-wide competition, resulting in the selection of a school champion who then competes at the state level. Kentucky’s state champion proceeds to the national finals in Washington, D.C., in April. Two past Kentucky champions placed second nationally and won a $10,000 scholarship. A total of $50,000 in awards and school stipends is presented at the national finals. Each state champion receives $200 and an all-expenses-paid trip with an adult chaperone to Washington to compete for the national championship. The state winner's school receives a $500 stipend for the purchase of poetry books. The first runner-up in each state receives $100, with $200 designated for his or her school library.